MAXX-ON PROVIDES A RANGE OF MIXTURES FROM SMALL TO PORTABLE UNITS WHICH ARE DESIGNED FOR ALL SORT OF PROGRAMMES. MAXX-ON, MX 15 provides General Purpose 12 Channel PA Mixer Preamplifier. 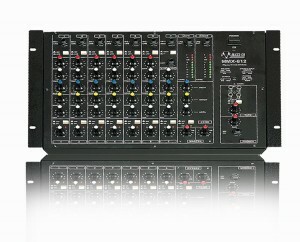 It have 12 Mic & 3 Aux Inputs. All inputs with On/Off switches with LED display. 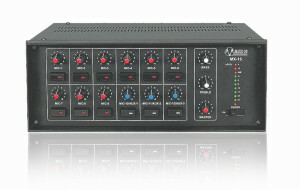 It has Master control for overall adjustment and 4 Line outputs for connecting a number of Amplifiers or Boosters. 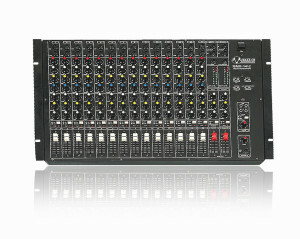 MMX 1412 HAS 14 Input Channels. Each Channel has separate 1/4” balanced phone jack for Mic and Line & accepts both balanced & unbalanced signals. It has controls the level of the channel in the final mix to Aux Send output. The AUX Send & AUX Return have been provided for sending the pre-fader output of channels for monitoring or for adding a Special Effects Unit. It’s Mono output is available from either Left & Right output jacks when the switch is in ‘Mono’ position and each channel has GAIN, BASS, MID, TREBLE, ECHO, PAN and slide LEVEL controls with CLIP LED indicator. Also Echo section provided with Delay, Repeat & Level controls. Tape section for Record & Playback facility. Mmx 812 has 8 Input Channels: Each Channel has a 1/4” phone jack selectable for either Mic or Line input & accepts both balanced & unbalanced signals. It’s Stereo Channel have Independent Stereo input through separate 1/4” unbalanced phone jacks for Left & Right channels. Each channel has Gain, Bass, Treble, PAN, ECHO and Level controls with Clip LED indicator. And has echo section provided with Delay, Repeat & Level controls. Tape section for Record & Playback facility. 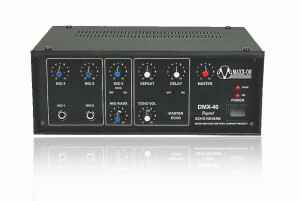 Dmx 40 is 4 Channel Mixer Preamplifier for Echo, Reverb, Chorus Effect with digital Signal Processing. It Compatible with Audio Mixing Consoles and has Echo facility on all inputs through Echo volume, repeat & delay controls. DMX 22 IS 2 Channel Mixer Preamplifier for Echo, Reverb, Chorus, Effects with digital signal processing. It has Peak LED for setting optimum distortion free input levels and has Echo facility on all inputs through Echo volume, repeat & delay controls.